We enjoy having Instant Pot Turkey Meatloaf about twice a month. The guys really like it, especially with a side of potatoes. The preparation is easy and it turns out great every time! This recipe is for a pressure cooker Turkey Meatloaf, or, with a few seasoning swaps, a pressure cooker ground beef meatloaf. 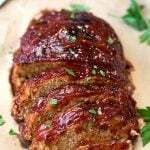 Turkey meatloaf doesn’t have to be boring. And this Instant Pot Turkey Meatloaf recipe is anything but boring! 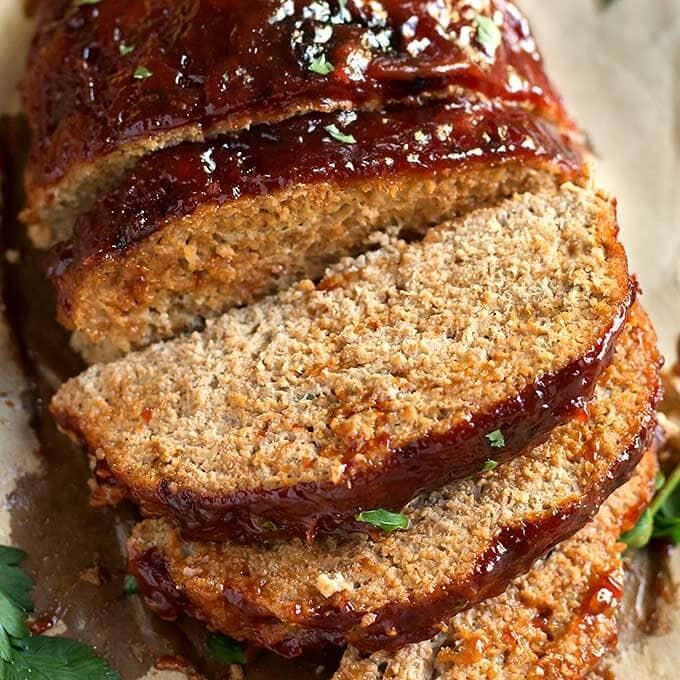 With a few seasonings and spices, this pressure cooker turkey meatloaf recipe is very flavorful! We have always liked a flavorful meatloaf. There are so many ways you can prepare the meat mixture in order to produce a juicy, tasty meatloaf. Ground turkey is a little more challenging, as it tends to be a bit bland, and can get dry. 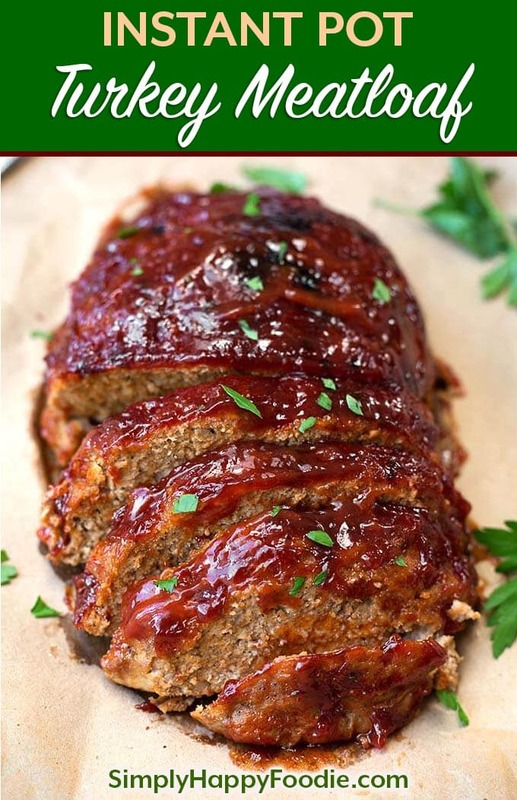 Not a problem with this Instant Pot Turkey Meatloaf Recipe! It has great flavor. That turkey won’t know what hit it! After pressure cooking the meatloaf, I pop it under the broiler so the topping can get caramelized. That just adds another layer of deliciousness to this turkey meatloaf! Leftover Instant Pot Turkey Meatloaf makes great meatloaf sandwiches! 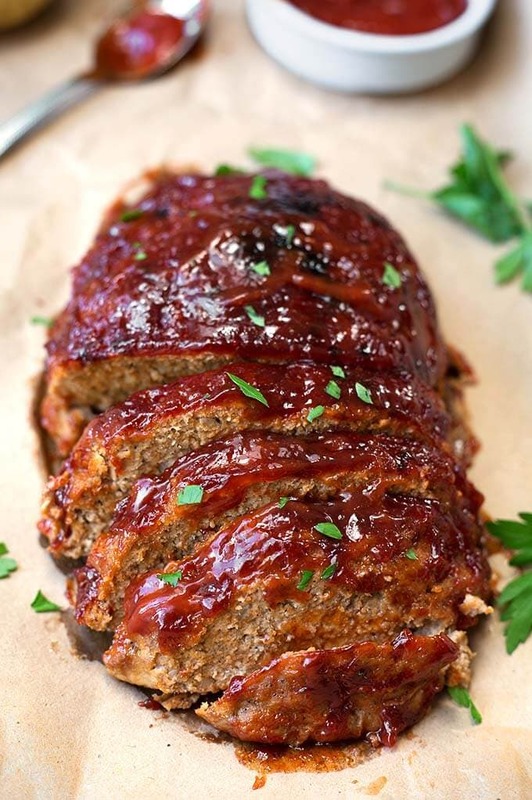 Instant Pot Turkey Meatloaf is flavorful and juicy. Simple ingredients and a sweet & tangy sauce makes this our favorite meatloaf! Mix all of the meatloaf ingredients together and combine thoroughly. Try not to overwork the mixture (Note that it is 2 lbs of meat). Put 1 1/2 cups of water in the Instant Pot, and the trivet/steamer rack. Place the meat mixture on a piece of foil and form it into a rounded loaf shape, making it an even thickness end to end, for cooking consistency. Grab the foil by the opposite corners, like a sling, and lift the meatloaf into the pot and set it on the rack. Close the lid and set the steam release knob to the Sealing position. Press the Pressure Cook button (or Manual) or dial, and use the +/- button to adjust the time to 35 minutes. When the cooking cycle is finished, and the unit beeps, just leave it to do a natural pressure release of 10 minutes. Then turn the steam release knob and do a Quick release of the remaining pressure. Before you take the meatloaf out, do 2 things. First, take the internal temperature of the meatloaf and make sure it is 160° F.
Second, use a small knife to poke a few holes in the foil, and the drippings will drain to the water below. I don't like to do this before the meatloaf cooks because I think I get a juicier meatloaf this way. My personal preference. Grasp two opposite ends of the foil and carefully lift the meatloaf out of the pot and onto a baking tray. Turn on broiler to 450° F. Rack in the middle. Spread the glaze topping all over the meatloaf and put it under the broiler (with the door partway open. Stay with it, for safety.) for a few minutes to caramelize the topping. Just keep an eye on it so it doesn't burn. Serve it with a side of potatoes or rice, a veggie or salad, and you'll have a great meal! *If making with ground beef, use thyme in place of the poultry seasoning. This was very tasty! I found the mixture to be pretty wet, so I added another 1/4 cup Panko. It cooked well, and the 7 year old devoured it! Hi Beth, thank you for the review! I think some brands of ground turkey are wetter than others, as I have run into this recently, too. I’m glad your little one liked it! Hi Beth, that’s great! Funny you should comment on this recipe because I just made meatballs from it! I like to bake them and freeze them for spaghetti, and other recipes! Thank you for your review! Thank you for this site!!! Question on the meatloaf… I have a few ready to cook meatloaves in the freezer in those mini throw away aluminum pans….. #1 Should I defrost the meatloaf and then cook in pressure cooker IN THE MINI ALUMINUM PANS…..or should I remove it from the mini pan and use a sling??? Thanks! When I am out of my miniloaves (already prepped) I am going to try yours! Hi Gale, I would try it in the pan, since it’s already in it. You may need to adjust the time if: The meatloaf is smaller or larger than the recipe states, and being in a pan the time will need to be a little longer, maybe a few minutes. I have never cooked with those pans, so I can’t say for sure how long. You can cook from frozen. How much time you add will depend on how big the meatloaf is. I recommend using a meat thermometer! Just curious about the part where you put the foil in the pot. Do you pinch the aluminum closed so that the meatloaf if fully encased in the aluminum or do you just use the aluminum as a sling to get the meat into the pot and cover the trivet? Hi Emily, I just use the foil as a base, and as a sling. Or you can use the trivet with handles to get it in and out of the pot. Sandy, does this mean that I can skip the foil entirely if I can (safely) place it on the trivet? Also, do you place the trivet in the pot with the handles propped underneath or upward along the sides? If you want to just set the meatloaf directly on the rack you can, if it will fit. I leave the handles up. Is there anything else I can replace the milk with? Hi Mike, just water or broth is fine. Just made this and it was DELISH!!! I used almond milk instead of the whole milk and I imagine rice milk would be a great substitute as well. My mixture was pretty wet, but once it cooked it was great! I wonder if leaving out the milk would make the moisture less wet and impact the taste? Is the milk necessary and what is its purpose? Hi Maria! The point of bread crumbs and milk is to lighten up the meatloaf so it is less like a heavy chunk of cooked ground meat. You can lessen the moisture by putting the bread crumbs in a separate bowl and adding just enough milk to make a smooth paste. Then add to the meat mixture. That’s really all you need. Then the egg will help bind it. Could I use a 7″ IP cake pan to cook this in? Hi Judy, it might be a little small. If it does fit, you may need to increase cook time 5 minutes ore so. I had a package of ground turkey I didn’t know what to do with so I tried out your recipe. DELICIOUS. Even my meatloaf hating husband liked it. Brava! Hi Xina, I’m glad you and your hubby liked the meatloaf! Thank you for the review! I had 2 problems that I have resolved AFTER reading this recipe. I tried meatloaf in a sealed stainless container on top of the potatoes in bottom stainless container. MISTAKE#1 – I didn’t add the water under the container in the pot itself, so it was, of course RAW, uncooked. MISTAKE #2 – I followed a recipe for the meatloaf that was 16 min, but obviously when doing PIP with potatoes ALSO, I need to move that time up – your directions say 35 min, which would likely resolve that issue. Now, here is an issue that I have not figure out yet, and I hope you can help as it was maddening! When re-doing, I added water under the sealed inserts, to the pot. I COULD NOT GET THE LID back on the pot. Everything was OK (fit OK, etc.) but, we could not get the lid to go on again after trying for about 15 min or more. I gave up, then went back again (because I’m stubborn!) and it went right on without changing a thing. Does it have to cool down or something in between uses?? Thank you!! Hi Brenda, how frustrating! I’m glad you ended up reading through the recipe. I always read through a recipe before I make it, just to get a general plan of what I’ll need and how I will make it. As for the lid not going back on, if the pot is still pretty hot, the steam can push the valve (pin in the lid) up and engage the lock and it won’t go on. What I do is push the pin down while turning it, and it goes on. If the pin is hot, use something heat proof to push it down. You can also run the lid under cold water. Make sure you reset the silicone ring in the lid. I RARELY give a review, but this recipe is review worthy. I need to start by saying that I didn’t realize it needed two pounds, not one, of turkey, so it was VERY wet. My husband suggested I use the Trader Joe’s cooked lentils (fresh food section) we had on hand, so I did. I also had a small bread pan (for alt. flour breads) that fit in my pressure cooker, so I used it, too. I tipped it out and put it on a small sheet pan prior to topping and broiling. That being said, I think it’s the best meatloaf I’ve ever had! I can’t wait to make it again. Thank you!! What a great recipe. Wow Cynthia! Thank you so much for your review, especially if you rarely give them! I appreciate it very much. I love that your hubby gave you a clever (and healthy) workaround for not having enough ground turkey! I have made this meatloaf for years, and having someone like my old recipe just makes me smile. This worked well using my usual approach of eyeballing the meatloaf ingredients. I’m sure the IP used a lot less power than heating up my oven to 375 for an hour would have (the broiling only needed a few minutes). That’s one of the reasons I use an IP when I can. I added some rolled oats to the mixture — I find it helps add body (and fiber) to the meatloaf — also added a little olive oil since my ground turkey was very lean, and used milk powder (more protein and calcium) and some tomato paste since we like our meatloaves tomatoey. That’s the great thing about meatloaf — it’s OK if it doesn’t come out exactly the same way every time. I often throw leftover cooked rice in, too, if I have any to use up. The foil kept the pot from getting dirty so there was also far less cleanup than when I cook the loaf in a bread pan in the oven. Mistake #1 as above, I didn’t realize it was 2lbs of meat instead of 1. I had been looking at other recipes and just got mixed up so it was very wet. The taste was wonderful though. I probably would leave out the milk though. Mistake #2 for us I think would be to not let it cook in the liquid so that it would not be as wet as well. We’ll see! I’m game to try again with more turkey. I also added some red pepper for a little kick as my husband loves anything spicy. Can you make with 1lb of meat and if so, how would you adjust the temperature? I would just cut it in half. Can I grind oats instead of bread crumbs? Also do I cook the meatloaf with the tinfoil left in the IP? If it’s just under 2lbs, do you suggest increasing the crumbs? Thanks! I think oats would be nice. They might absorb more liquid, so maybe don’t increase them. The foil does stay in the pot. The meatloaf sits on it while cooking. You can use the foil to lift it out, or if the handles of the trivet are long enough, use that. I do suggest either poking holes in the foil before lifting out, or use a turkey baster to suction out the hot juices before lifting out. I only had one pound of turkey, so I upped the bread crumbs to one cup and added a handful of frozen corn. Otherwise, I stuck to the recipe and it turned out great. I’ll be making this again, for sure. PS I want to try the hamburger stroganoff recipe next. Sounds great. I am going to try it with just 1 ib of turkey. Do I understand right that the cooking time would be 17 or 18 minutes? Hi Anna, maybe try 20 minutes and see how you like it. Hi Sandy. I made your recipe in a Mealthy Pot, and it was absolutely delicious, tender and juicy. I didn’t have everything in the house, and my husband can’t have pepper, so I left the pepper out, and substituted low salt organic soy sauce for the worcestershire sauce. I also left out liquid smoke (unavailable where I live and it sounds like something that would have chemicals in it). Oh, and I also used monk fruit instead of the the brown sugar. I was afraid my substitutions might not work, but it was fantastic. Best meatloaf I ever made, and so much healthier than the traditional ground beef recipes I’v tried in the past. Thanks for sharing. I’ll be looking for more of your pressure cooker recipes to try. That’s great, Susan! I’m so glad you could make the recipe with ingredients that you have on hand, and are within your diet. Thank you for your review! We loved this and will make it again. I cooked it with tiny potatoes under the trivet for easy mashed potatoes. I can’t wait to make meatballs with this recipe for my freezer – I am not a fan of most of the store bought ones. I made a 1 lb loaf and cooked for 30 mins. When I took the temperature to be sure it was done, it was over 200 degrees yet wonderfully moist and delicious. Even I can’t mess this up! That’s awesome, Donna! Yes, the meatballs are very delicious with this recipe!